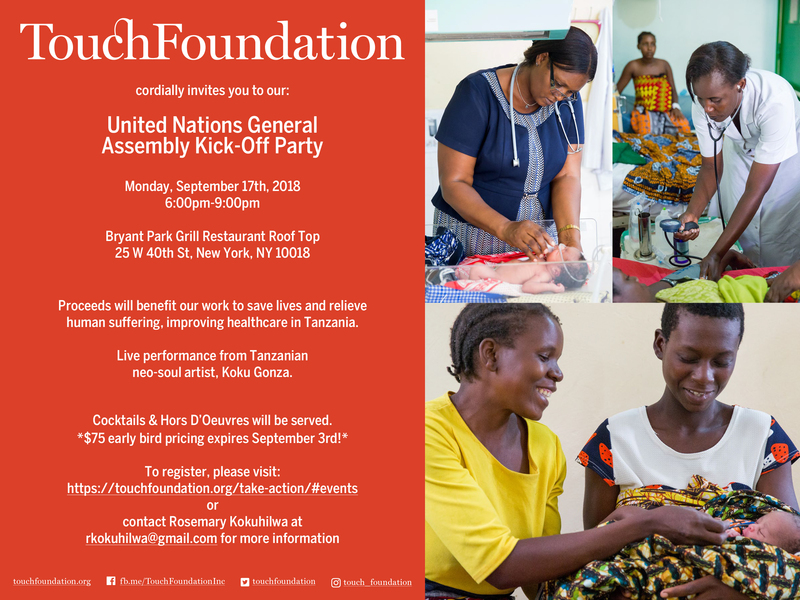 Join Touch Foundation as we celebrate the start of the 2018 United Nations General Assembly (UNGA). Enjoy cocktails and hors d’oeuvres, music by DJ Kris Graham, a performance by Tanzanian neo-soul artist Koku Gonza, a silent auction, and networking. Proceeds will benefit our work to save lives and relieve human suffering, improving healthcare in Tanzania. Please contact Rosemary Kokuhilwa at rkokuhilwa@gmail.com with any questions. Co-Chairs: Mari Agory, Georgie Badiel, Mbago Kaniki, and Flaviana Matata. Host Committee: Nathan Chiume, Nellie Donhossou, Chike Eleazu, Celia Felsher, Isabel Fraser-Moodie, Koku Gonza, Hawa Hassan, Judith Heard, Tasleem Kassum, Justa Lujwangana, Bernitza Lafleur, Joy Martin, Gloria McCarthy, Sylvester Mwingira, Pauline Obura, Roxy Ottizy, Sné Patel, Grace Rwechungura, Doris Rweyemamu, Salematou Sacko, Mina Sanosi, and Giovanni Selvaggi.